The best post-Nolan DC film, period. Made for dC fans looking to see if WB can keep the goods coming. Psst, they do! It’s been a while since I last watched Chuck, and forgotten how charming and hilarious Zachary Levi is. In pitch perfect casting, Levi completely embodies the titular Shazam! as the grown-up version of young Billy Watson (Asher Angel) in the ultimate wish-fulfillment superhero comedy. DC Films has also clearly learned a thing or two about not trying to force their own cinematic universe. 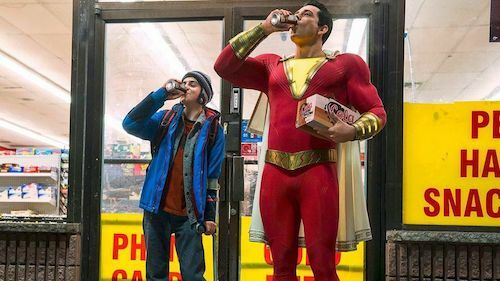 Letting director David F. Sandberg loose with the hilarity, heart, and heroics, Shazam! is an amazing adventure for the whole family. On a snowy winter night in 1974, young Thaddeus Sivana (Ethan Pugiotto) has a run-in with The Wizard Shazam (Djimon Hounsou) after he’s transported from the family car when his Magic 8 Ball malfunctioned. Too bad for Thad, as he learns his heart isn’t pure and he’s sent back to his mentally abusive brother and father (John Glover). In the present, young Billy is a teen on the run from child services while wanting to find his absent mom who he became separated from at a carnival as a kid. Billy is quickly taken under the wing of Rosa and Victor Vasquez (Marta Milans and Cooper Andrews). Here, he meets his motormouth, superhero obsessed, paraplegic foster brother Freddy (Jack Dylan Grazer). After Billy defends Freddy from a couple of bullies, Billy winds up being whisked away to see The Wizard and learns his heart is pure enough to grab The Wizard’s shaft, shout “Shazam!”, and become the adult super version of himself. Meanwhile, Thaddeus (Mark Strong) has finally found his way back to The Wizard’s lair where he’s overtaken by the spirits of the Seven Deadly Sins and must put a stop to Shazam if he wants to become the ultimate supervillain. Shazam! is Superman meets Big. Thankfully, the film doesn’t try to keep the laughs going for the whole runtime or it would run the premise into the ground. It’s nice to see Sandberg taking time outs for the audience to connect with not just Billy, or Shazam, but with the rest of the cast as well. And in a fun twist at the end, they all get their chance to shine and threaten to steal the whole movie. Levi is amazing in a role he seems born to play while Grazer continues to be every bit as hilarious as he was in It. The kid has a huge future ahead of him and it’ll be fun to watch him grow up onscreen. Screenwriter Henry Gayden finds the perfect balance of laughs and sweetness without the latter getting overbearing. There are two end-credit scenes, one which sets up future plotting and the second lands huge laughs. Shazam! is the perfect antidote to the gritty misfires and is the best post-Nolan DC film, period.